Driving back to Singapore from our Chinese New Year pilgrimage to Ipoh, we decided to stay overnight in Kuala Lumpur. Contrary to both locals and Singaporean’s who treat the motorways in Malaysia as a Nascar training ground, it is prudent to be wary of inane reckless drivers, taking one’s time and splitting up the trip. Incidentally, in the midst of a deluge of rain, we encountered an accident scene where no less than 18 cars were in nose to tail pileup! We decided to stay outside of Kuala Lumpur to avoid the notoriously chaotic city traffic, opting for the Saujana Hotel close to the Subang airport. Whilst an old and tired hotel, it has a resort-like feel to it and perfectly adequate for such a purpose, particularly if you enjoy a game of golf. For a more pampered stay, the adjoining Saujana Club, both run by the GMH group, has been recently renovated and apparently ‘The’ place to stay in KL. The previous evening in Ipoh, my wife caught up with an old school friend, Eddie, over drinks at Indulgence, which is where we were staying (a separate article on this cutting-edge, if not enigmatic boutique hotel is pending). Eddie actually owns a restaurant and groovy bar in in KL called Frangipani, to which his chef partner, Chris Bauer, describes as modern French. Thus, it was decided we would have dinner there the following night. Negotiating the traffic from our hotel was, as expected, a harrowing experience, augmented by rain and car accidents happening all round us moreover, negotiating the maize of one-way streets. Thanks to my brother-in-law in the navigator’s seat armed with my laptop and Google Maps, it was relatively painless, likewise parking as we were guided in by the restaurants valet on approach. Greeted by the restaurant manager we were whisked inside from the rain through a modern foyer and stainless steel panelled walls to a contrasting and most impressive Moroccan style interior, bathed in creamy white with towering rectangular columns, dramatically enhanced by a black pool in the centre with overhead skylight. The space oozes an exotic Casablanca ambience; softly lighten with luxurious space between tables and romantic nooks overlooking the pool. The staff where immediately attentive, moreover I was most impressed by the managers attention to our five year-old daughter, seeing to her needs first with an intelligent conversation on what she would like to eat. Looking through the menu, tea smoked salmon served with toasted bread was identified as the most appealing, to which he suggested putting the order in to the kitchen before taking ours and was subsequently arrived simultaneously with our pre-dinner drinks. This might all seem superficial to those who do not have children, but it thoroughly impressed us and was strategic to the enjoyment of the evening. Furthermore, this flawless service continued all night, highly attentive yet not obtrusive and with genuine purpose. This impression of genuineness was substantiated by the intelligent interaction between staff and guests and whenever any staff member was out of their depth, they immediately sort assistance from the manager or kitchen. I have not encountered such excellent service in Asia in recent memory and the front-of-house experience on par with one and two star Michelin restaurants we recently experienced in Italy, with the caveat the best travelling accessory you can have in Italy is a bambino. This sort of service is rarely achieved outside of owner-operated establishments and all credit to Eddie and Chris, although Eddie had that grimacing look of frustration when I brought up the subject of staff, and clearly he has his work cut out for him with the Malaysian mind-set. Moving on to my personal priority in restaurants, the wine list here frankly has more depth than anything I have seen in Asia, period! No, it is not an encyclopaedia of trophy Bordeaux’s, although there is a certainly a broad representation of claret, astutely focused on St. Emilion and Pomerol. 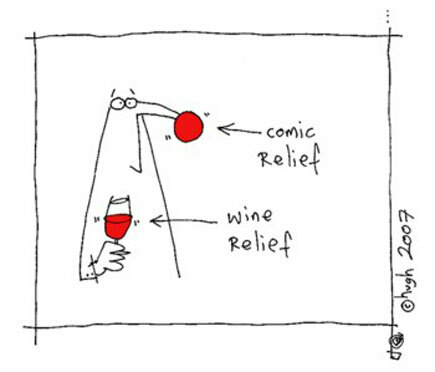 There is also a meticulous, concise range of new world wines, selected with savvy precision. All that said, the strength here is the comprehensive range of Rhone, Languedoc and Roussillon wines and clearly a personally driven selection – that is you can sense a propriety feel to it, if not obsession. Obviously pricing is an issue in country like Malaysia, inhibited by punitive taxes on alcohol however, the restaurant-level prices here are extraordinarily good value, not only by Kuala Lumpur standards, but very competitive with metropolis’s like Hong Kong, and they have no tax there, just extortionate margins! In conversation with Eddie and Chris, it was revealed they bring in a lot of wines direct from France and travel the different regions annually looking for new discoveries, along with enlightenment and inspiration for produce and menus. We chose a Domaine Vieille Julienne “Lieu-dit Clavin” 2007 Cotes du Rhone Blanc, highlighted on the wine list and also served by the glass: fragrant with white blossom and white peach, with hints of blanched almond and tarragon, it had a caressing oily-textural palate saturated in apricot and melon flavours yet, refreshingly savoury and nutty with vibrant lemony acidity. Clearly well-made clean, modern Rhone white and with little wood influence – actually a Chateauneuf du Pape producer of much repute – and would easily benefit from two or three years bottle age, but delightful now. To follow we had a red from one of my all time favourite producers on the planet, Domaine Pierre Clavel La Copa Santa 2005, from the Coteaux du Languedoc – the hills that is and I can assure you, far-flung. It was such a surprise to see this on a wine list in Asia little lone Kuala Lumpur. It is brilliant wine to which I will post a full tasting note and article shortly; very good value at RM260 on their restaurant wine list. By this stage you’re probably wondering if I am ever going to get around to the food! For the record, I divide up my analysis of fine dining restaurants in quarters; ambience/decor, service, wine list, and food, in no particular order of preference although clearly I have a wine bent. However, all facets are equally important to a complete dining experience at this level. In my opinion, too many reviewers place an inordinate emphasis on food alone. In a broader view, one has to put things in perspective relative to the establishment, or the occasion and circumstances; i.e. one doesn’t really place much emphasis on the decor when eating communally at your convivial local Thai, or if catching up with a group of friends, perhaps the wine list and bar is more important for compotation than the food. For starters, the menu at Frangipani is unique with elaborate descriptions of every dish written by the chef, combining enticing explanations and philosophy behind the produce or influence from regions and travels, with a good deal of humour and personality behind each depiction. For example, Bauer’s description of his Herb poached ocean trout fillets, “DON’T immediately turn your attention away when you read the word “poached”. In this case, it does not spell “boring”! Our delicious ocean trout fillets have been lovingly marinated in herbs – gently rubbed with mother’s best olive oil and then wrapped air-tight before we poach them at 75°C. In this way, the taste stays in the fish, not in the water”. As chef Bauer pointed out, his cuisine is modern French, to which I have interpreted from conversation with him he is deeply rooted in his native French cooking but takes a pragmatic view and contemporary approach to what he can source in Malaysia, considering it is a somewhat restricted marketplace. Alas, there is less Asian-produce influence in his food, although seafood from Japan is prominent, much of it is sourced from Australia, New Zealand and of course France. The A la Carte menu is planned to entice several course dining, with an extensive range of first, second and third courses priced respectively at RM30, 45 and 60, with small additional charges for more extravagant produce. Serves are kept to a sensible size and an overall light touch to the cuisine with adherence to basic cooking techniques rather than elaborate garnishes or overcomplicated dishes. You can opt for a three-course (full-size portions) of your choice for RM120, add RM20 for dessert, obviously encouraging you to sample as much of the chef’s repertoire at a reduced price. There is also a tasting menu comprising seven smaller courses at RM$158, or $258 including a wine paired with each course, to my mind, extremely good value indeed. Suffering from the obligation of overindulging at the Chinese New Year family feasts we were already resigned to a relatively light meal, all opting for smallish, delicate starters. Three plump fresh oysters from Kumamoto served with a vinaigrette of miso, white wine vinegar and olive set my brother-in-laws palate on the right track. Moreover, it was encouraging to see oysters from the northern hemisphere where it is winter and the oysters at their best, as opposed to a substandard experience we had recently where Australian oysters were proffered in complete ignorance of the seasons (more on this in an upcoming berating). My Pan roasted porcini powder dusted Hokkaido scallop was perfectly cooked; a large and fleshly specimen that was crunchy yet melted in the mouth and had that wonderful interplay of sweet scallop meat and sea saltiness. I could have easily had six of these washed down with our Rhone Blanc as a complete meal. My wife had immediately zeroed-in on a classic bouillabaisse inspired dish, it being one of her favourites yet terribly difficult to find a chef who can make a decent one. We used to frequent a French Bistro in Melbourne called La Madrague where chef, Jacques Heraudeau, a humble veteran of the stove and staunch traditionalist, made an ambrosial bouillabaisse that required a large baguette to mop up every last drop in the bowl, paired with an aged Rhone white which has the richness and oily texture to compliment the flavours yet a nutty, sherry-like character that keeps the palate fresh. Thus, the Rhone Blanc we were on paired well and bouillabaisse was brilliant, an equal to chef Heraudeau’s (now retired) with all the hedonistic intensity of fish broth and crustacean reduction with a creamy texture yet light on the palate and perfectly cooked seafood morsels. Bravo! The male contingent were not terribly adventurous with our main courses, as we were both in the mood for a good steak, myself opting for a grass-feed Angus Porterhouse and my brother-in-law a Wagu Rib-eye topped with pan-fried fois gras. I think I alluded to a light meal? Both steaks were perfectly cooked and hit the spot admirably. 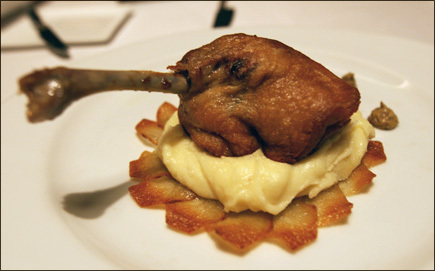 My wife chose Duck Confit, as simple as it looked in presentation, served with a potato puree, it was cooked to perfection. Duck Confit is one of those dishes or techniques that can go terribly wrong with the duck leg looking inviting with its golden brown skin and wickedly fatty flavours however often the actual meat is dried out and like chewing on balsawood. It is a dish that requires patience and a thorough understanding of traditional techniques, to which Chef Bauer indubitably demonstrates. We decided to have a cheese platter to mop up the rest of our red wine, all of which were in excellent condition and ripeness, cheese being another peril of restaurants in Asia. We were equally impressed by the variety of the selection and quality of the cheeses, so much so another glass of red had to be ordered! The consensus is we had a most enjoyable experience at Frangipani and whilst this is not an inexpensive restaurant, it certainly offers very good value for the overall package. The restaurant has been going for 7 years now, thus has a well-established following and proven track record. This is to date, our benchmark for fine dining in Kuala Lumpur and must-visit. Whilst I had a quick tour of the upstairs bar, we did not have opportunity to road-test it fully but by all accounts, this is one of the hot-spots of Kualu Lumpur’s night scene where you will encounter the cool and beautiful people of KL. It is an enormous space with modern-chic décor and lots of different spaces and lounging areas, some more secluded for naughtiness. With a reputation for the best cocktails in town, resident celebrity bartenders or mixologists as they are now called, Ash & Amin, will concoct something lethal for you. There is a resident DJ, DJ Sito (Spanish) to who opens with “cool chill out vibes, which progresses to hip grinding funky, Latin house as the evening heats up”. Eddie is candid about the bar, “It pays the rent, and it’s a lot of fun.” He goes on to say, “We have had people coming to the bar for years, like five years, and they don’t even know the restaurant downstairs exists!” So, if you are looking for the complete night out on the town, Frangipani has it all; you can start with drinks a 6pm in the bar, dinner from 7.30pm, head back to the bar to chill out after dinner or grove on till 1am. Brilliant!